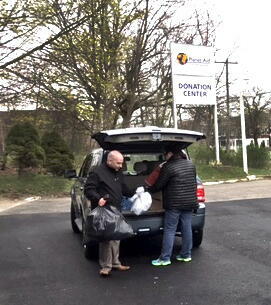 Newport and Wakefield Donation Centers Hold Earth Day Donation Drives - Planet Aid, Inc. The Newport Donation Center in Newport, RI, and the Wakefield Donation Center in Wakefield, MA, both held Earth Day Donation Drives over the weekend. The drives were a great success, with a total of 13,654 pounds of materials for reuse collected between both drives. These materials include clothes, household items, books, toys, and trash. "We had a great turnout and appreciate all of the support from the two local communities. It was great to see so many people come out and contribute to efforts in cleaning up our environment in honor of Earth Day," said Keith Gregory, Operations Manager. The Newport Donation Center is located at 533 Broadway in Newport, and the Wakefield Donation Center is located at 349 Water Street in Wakefield. Both centers accept clothing, shoes, books, small appliances, and other household items. We do not accept furniture, TVs, or large appliances. For more information, visit the Southern New England Local Page. 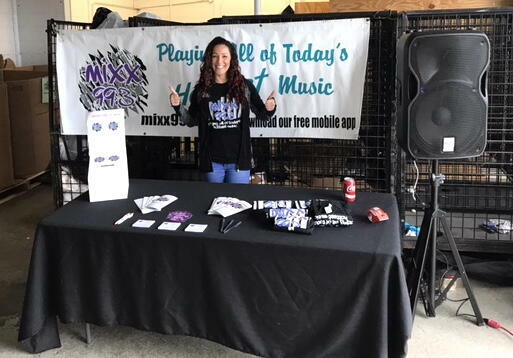 Mixx 99.3 at the Earth Day Donation Drive in Newport on April 22. The station provided music, free giveaways, and snacks.